As some of you may know, the district I am in specializes (or "departmentalizes") by subject, even in K-5, so I am in charge of teaching all of the 1st grade math for my building. I am also in a grad program for elementary mathematics and lead the Vertical Math PLC for our building, so I enjoy finding blogs & posts that specifically relate to elementary math. 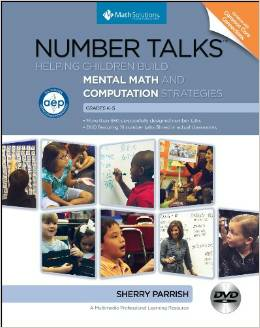 I recently stumbled upon The Elementary Math Maniac blog and discovered that she was going to be hosting a book study on the Number Talks book by Sherry Parrish. I had been given this book a couple years ago but had not read it yet (don't judge...you know you've done that too! ), so I thought this book study would be a perfect opportunity to dig in. 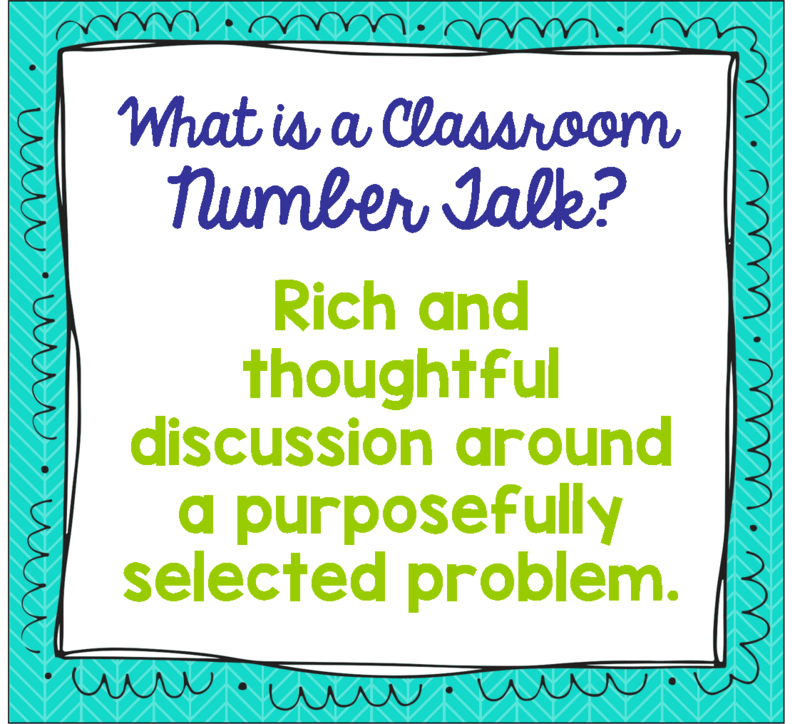 Essentially, a classroom number talk is a discussion around a particular problem. The teacher displays the problem, and the kids are first given a chance to solve it independently. Then, the teacher takes and records all answers (both correct and incorrect) so the class can discuss the strategies used. 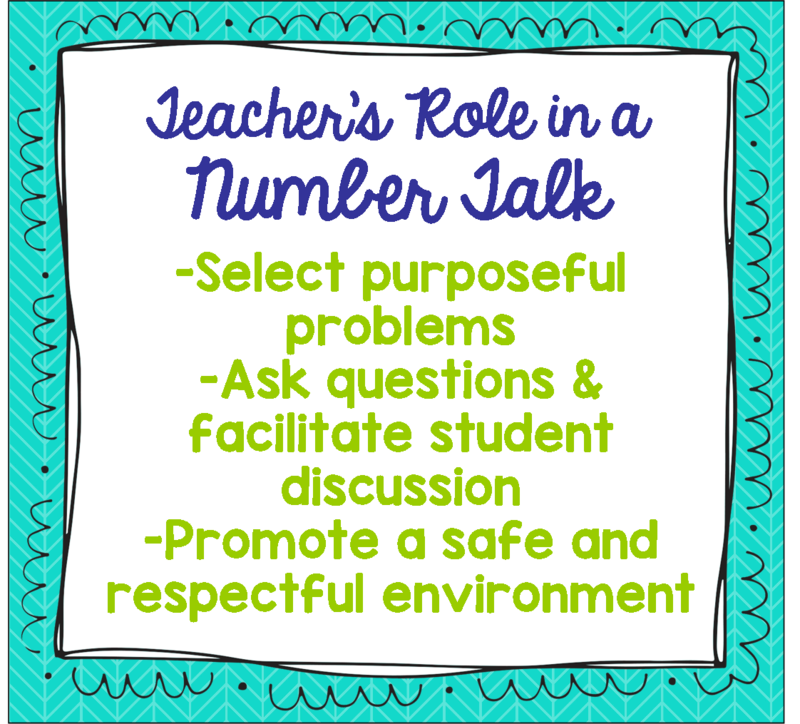 So, what's the teacher's role in a number talk? When discussing a problem, ideally the teacher's role is that of facilitator, but it's going to take some time to get there. Kids (especially younger kiddos) are going to need lots of modeling and practice with how to respond to one another and ask questions. 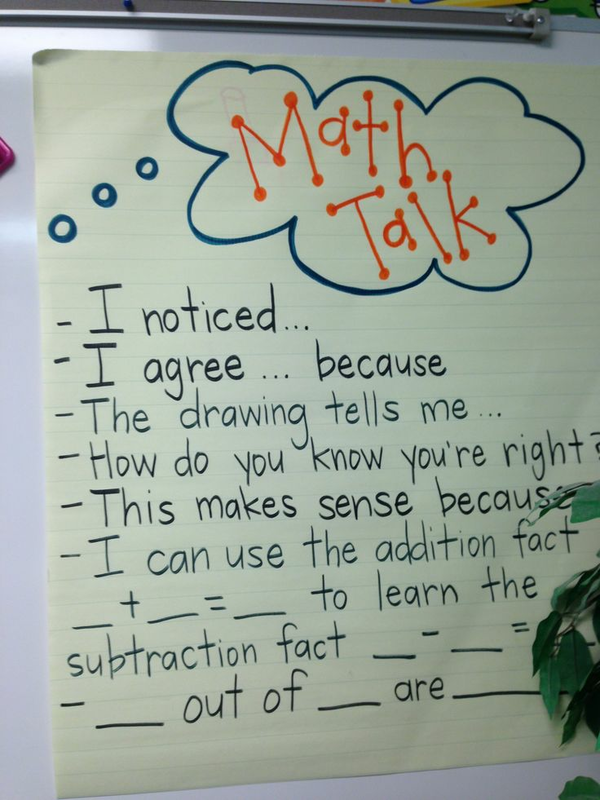 I love this pin of math talk discussion starters. This pin was image only...if you know the original source, please let me know! The book mentions the importance of teachers keeping a "blank face" when accepting or discussing wrong answers. We all remember that "teacher face" in school when we gave a wrong answer. We knew it was wrong even before the teacher explained our mistake because of their face, and it didn't make us feel good or want to keep participating. Allowing and accepting all answers for discussion lets students with incorrect answers to defend and explain their thinking, which helps the teacher to see misconceptions and the student to feel that making mistakes is ok. Being purposeful in selecting the problem is also an important role for the teacher. If the goal is to discuss various ways to solve 3 addend problems, the numbers selected for the problem should assist that goal. For example, the problem 3 + 7 + 3 would allow students to use doubles (and then near doubles when solving 6+7), finding a ten, or counting up. If the teacher wanted to focus on borrowing from one addend and giving to another, a problem like 8 + 5 + 3 might be helpful, because the student could take 2 away from the 5 and give it to the 8 to make a ten, leaving them with 10 + 3 + 3. Sherry Parrish also recommends that teacher's have a specific spot in their classroom where they hold their number talks. Mine is on our carpet, as it's the place for students to be close to one another. She also recommends that teacher's have something to record student thinking, whether that be up on the Smartboard or on chart paper. Posting student strategies as anchor charts around the room can help keep students accountable during that time. So how do I incorporate number talks? I have to admit, I did a better job with this at the beginning of the year than I have lately. Mostly because I started the year off doing a LOT of subitizing and activities from my number sense pack. We had some great discussions, even as beginning first graders, about the different ways that we saw numbers. I have continued number talks occasionally in guided math, but have not done them whole group in awhile. What I would like to start doing is creating a bank of problems to use for my number talks. I think that having the problems ready to go will help me be more consistent with implementing number talks throughout the year. Thank you for your blog post in conjunction with The Elementary Math Maniac's book study of Number Talks.I appreciate how you broke the chapters down, added visuals and explained how you have applied the concepts in your classes. I too started the school year with Math Talks and then kind of fizzled. I agree with the idea of creating a problem bank. It would help with organization and application. I look forward to starting the new year implementing rebooting math talks as part of my program . Thanks again. Eli, thanks so much for your sweet comments! I'm glad this post was helpful! Hi Katy! I am so glad you linked up for this book study! I think book studies are a great way to stay committed to reading the book and I get so much more out of it when I can hear and interact with others. I love your enthusiasm for teaching math and enjoyed reading your post. When I first started doing number talks, I kept a small notebook with a few problems in it that me and a colleague planned ahead of time. As I did a number talk with a class, I would spend a few minutes writing down other ideas for the next one based on the information I gathered about their skills. That worked really well to help me feel like I was planned for the next time. Now that I have been doing it for a while, I really don't plan to this level of detail. I look forward to reading your thoughts next week! Tara, I love the idea of keeping a notebook and jotting down a problem for next time after seeing what the kids come up with! Thanks for sharing that with me! Katie, I think you did such a fantastic job of explaining the importance of being purposeful in your number selections. This is a great post.I'm going to share on my blog in an upcoming post. You did a great job explaining the concept, thanks for that! Your blog is adorable, by the way!